I found this on reddit. I don’t know who the artist is. If you know, please tell me so I can give them credit. I found this image on Facebook and traced it to reddit, but I don’t know where it was posted originally. This picture gives me strong emotions, both good and bad. I am a plus-sized woman. I am actually what I would call fat. And for the most part, I’m okay with it. I know what I need to do to lose weight and I don’t do it. One day I will, but for now, not. But every now and then, I think this is not good. Now I’m generally in favor of women taking up space. I believe part of the cult of thinness is about women being as close to invisible as possible. Standards of beauty for women become ever nearer to looking like a 9 year old with breast implants. We are infantilized and diminished. And we buy into it. We police ourselves. I have had more women comment on my, ahem, lack of personal grooming of the lady parts, than I have men. Or as a friend of mine says, “Once you get naked with a guy, he has pretty much decided that what you got, he’s willing to work with.” Women are more, well, they put you down about it. Taking up space is one way to equalize the playing field. Men take up space. They stand tall, they gesture large, they sit in a chair with arms and legs akimbo. They have no problem owning their space. Women, if we’re ladylike, sit with our legs together and tucked under the chair. We don’t make big gestures, we cover our mouths when we laugh. We try very hard not to take up space. If we want to be treated as equals, we need to learn to act like it. 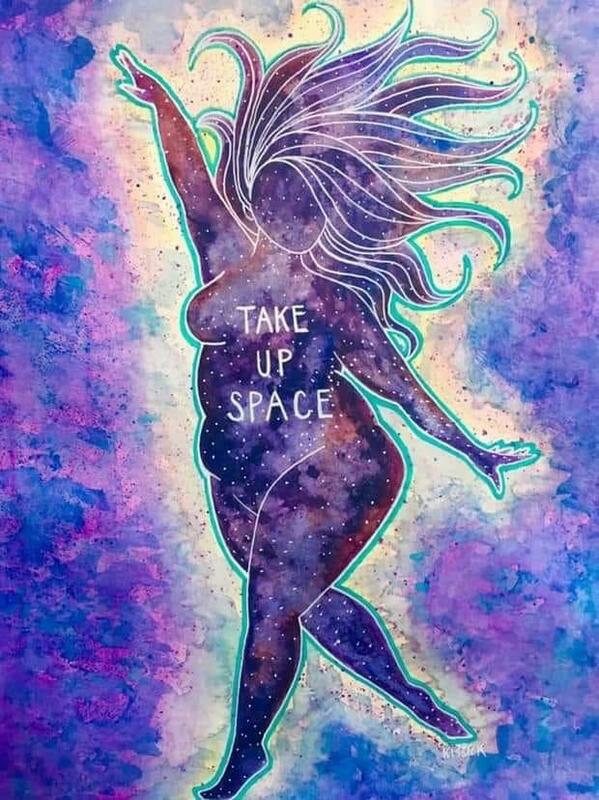 I”m also down with the body positive aspect of this. Have a body. Have a big body. Don’t be ashamed or embarrassed. Be proud and carry yourself well and dress beautifully. Go skyclad. You carry the universe within you. There is a goddess perspective in the image. Much like Venus of Willendorf, this is a good sized mother goddess. She is free and dancing and all of creation is within her. She is mother nature for the cosmos. She has literally taken space up into her body. But taking up space. That is exactly the point at which I become uncomfortable with my size. I don’t fit comfortably in airplane seats. I love live theater and my body crowds the people around me. My size is rude. I am not a rude person, but I infringe on other folks’ personal space, and that is impolite. It makes other people uncomfortable, and that makes me uncomfortable. Fat is a feminist issue, as Susie Orbach has observed. Body size is nobody’s business. But is there a limit? At what point am I taking up more than my fair share of space? When am I eating more than my portion of food? And how much of this is a uniquely American concern? Size is political. What does my size say about my politics? Categories: 5 Tigers, confidence, Inspiring, reality check, sexism, Things to think about, wellness | Tags: body positive, Facebook, fat, fat positive, feminism, feminist, reddit, Susie Orbach, take up space, women | Permalink.